Effective groups learn to use their personality differences to strengthen the group, not weaken it. This is a good tool to identify different group types and how they relate to each other. We learned it from Training for Change and tweaked it a bit ourselves. Time: 60 minutes. Materials: Flip paper, markers. Related tools: Making a group decision. Suggest ideas for what you and the group could do? Make sure that all the other members of the group are ok, encourage and support those who seem anxious? Want to speak to the pool manager to find out how deep and cold the water is, what other groups might be there, how long you have? Give time for everyone to decide which would be their primary response. If it’s difficult, suggest they remember how they were when they were, say, 8 years old, or when they feel under pressure. Put up the flipsheet with the four types and talk it through. Ask the group to remember their swimming pool responses and identify where each response fitted (1=East; 2=South; 3=West; 4=North). Everyone has all of those characteristics, but which is usually strongest? Which of the other types challenge us? How? Which of the other types are good to work with? Why? After 10 minutes or so, bring everyone back together and ask each group what came out of their conversations. Make it light-hearted and fun. Reflect back what you’ve heard. Negotiation (optional): if you have time, you might want to invite members of different groups to meet together for 5 minutes or so and discuss how they can work together in a way that affirms their differences and enables them to collaborate. Then bring them back together and ask what had been agreed. 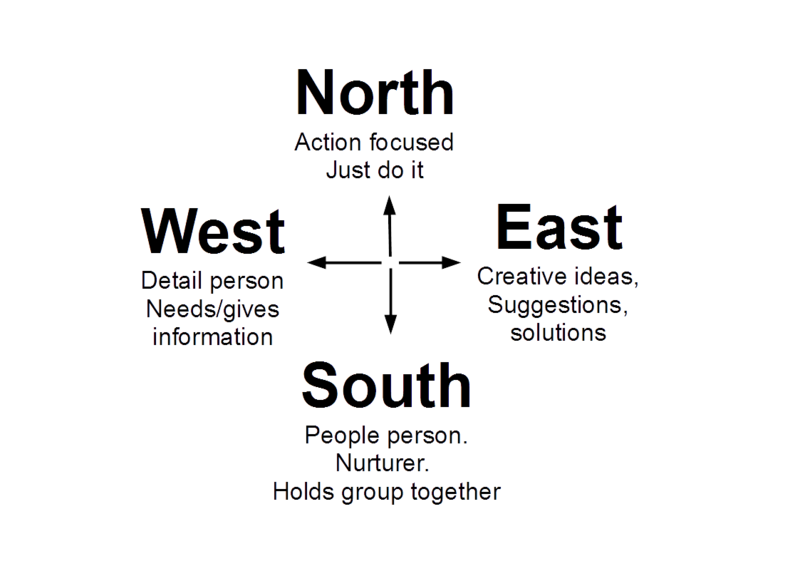 Recap the tensions and conflicts that can occur between different groups, eg North and West. What was said about the positive contributions each type can provide to a group or movement? What was noticed about the balance in this group – well balanced or more of one type? What might that mean for the group and its work? Research shows that the most effective groups have a good balance of all the types. And they have learned how to manage the conflicts this brings. Once a group has learned to deal with its own problems and conflicts, it can take on a bigger one. And once it has managed that, it can take on an even bigger one. What will the group do with this learning?